Hilton-Homewood Suites Workers Encouraged by 1st Bargaining Meeting! 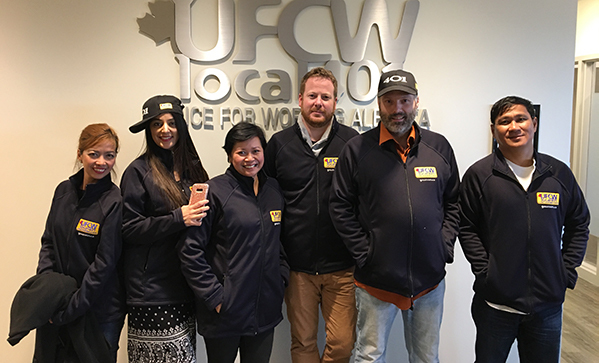 Employee representatives who attended Union negotiations with hotel management on June 14, 2018 could not help but feel a sense of strength. It was a new day for the employees who now constitute a Union. The Employer was forced by law to meet with the Union negotiating committee and commence negotiations for improved terms and conditions of employment. The meeting was held in a boardroom in the Union’s newly built headquarters in the Northeast of Calgary. The Employer sent two representatives, one was General Manager Robert D’Orazio and the other was a gentleman named Jay Sharun, apparently a paid consultant from British Columbia. While employee representatives were buoyed by their strength and solidarity, it became unfortunately clear that the Employer still didn’t get it. Though Mr. D’Orazio seemed conciliatory their consultant on the other hand had a tone and demeanor that was disrespectful to the hard working staff. Perhaps Mr. Sharun represents the voice of an arrogant American absentee landlord employer. Perhaps Mr. D’Orazio has some real sensitivity to his staff. It could be too early to tell but we will continue monitoring the situation carefully. The most important thing is the optimism and the solidarity from among the staff representatives. Union negotiators started to introduce some critical issues to the Employer. Employees want to have discussions and negotiations around the issues of wages, benefits, TIPS, and workloads. Health and safety concerns are apparent. The next step involves the exchange of actual contract proposals. We have reminded the employer that your hotel is a unique property that has a lot of potential in the prosperous and growing East Village. We are convinced that the potential for this hotel is best achieved with significant improvements to working conditions for its hard working staff. The Employer has just confirmed that your property is in fact up for sale. Alberta labour law guarantees that any new employer will inherit the Union. That’s the good news. But the bad news is that change could be coming and you may have to face new uncertainties, insecurities, bosses, and problems. Many staff are telling us that they are very glad that they have the power of a Union behind them during this time of transition.